German researchers Philipp Gellert and Martin Müller of the Business Innovation and Change Management Dept. 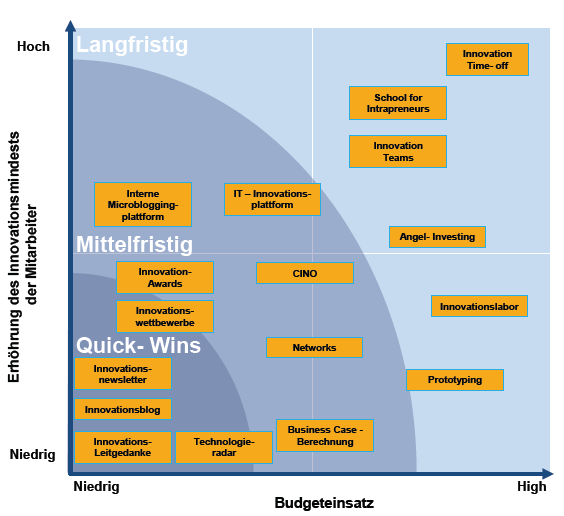 of the University of Applied Science in Munich, Germany (Hochschule München) published their international business consulting study “Konzept für Führungskräfte zur Implementierung einer Innovationsstrategie” (in German language only) in summer 2014. Graphics on page 57 shows “School for Intrapreneurs” and “Angel Investing” as long-term shifters of employee innovation mindset in the upper right corner!